The road between Londonderry and Bridgend has reopened after a security alert on Sunday night. Four masked men claiming to be members of the Real IRA hijacked a white Transit van on the Coshquin Road in Derry at about 1930 BST. 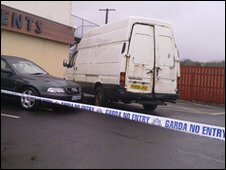 The van was then left outside Blackthorn Amusements in Bridgend. Some houses and businesses were evacuated. Donegal Sinn Fein councillor Padraig MacLochlainn called on those responsible to explain themselves. "They are a tiny percentage of what the IRA were at their height, and they clearly have no military or strategic competence. "It's time we heard from them or the people who speak for them about how they are going to achieve their objectives by doing things like this. "What's what is this type of carry-on going to achieve?" Donegal senator Cecilia Keaveney said she assumed the incident was part of "ongoing actions where people are being discommoded right across Ulster. "I think it's about time we asked the question, who are these people representing?"